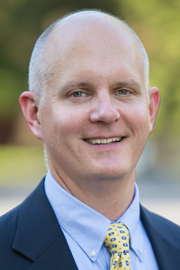 Brian Young is a Clinical Associate Professor and Director of Curriculum for the Baylor University Doctor of Physical Therapy Program. Dr. Young graduated from Wabash College in 1994, completed an MS PT from Des Moines University (1996), and a DSc from Baylor University (2002). Additionally, he graduated from the Army-Baylor Orthopedic Manual Physical Therapy Fellowship (2002). He is an ABPTS board-certified Orthopedic Clinical Specialist and a Fellow in the American Academy of Orthopedic and Manual Physical Therapists. Dr. Young served over 21 years in the US Air Force, holding various clinical and leadership positions. He retired in 2017 after serving his final assignment as Associate Professor of the Army-Baylor Doctorate of Physical Therapy Program. He has several research publications and presentations, is a recipient of the Journal of Orthopedic and Sports Physical Therapy’s Rose Research Award, and is currently working with the American Physical Therapy Association exploring primary care roles for physical therapists.